Greg Morthole and Justin Seidenfeld both join Steve Jaxon and Dan Berger today on California Wine Country. 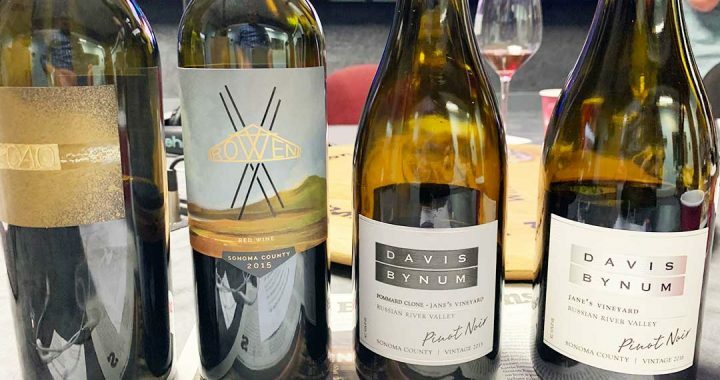 Greg Morthole is the winemaker from Davis Bynum Winery and Justin Seidenfeld is the winemaker for a new project called Rowen. It’s a new single vineyard at high elevation which has been in the works for 15 years. Steve asks Greg Morthole He majored in natural sciences, he went to University of Wyoming but took many wine classes since then. First he went to Sacramento, then came to Sonoma County. It’s very high and cold in Wyoming so they can’t grow many grapes except in some western regions. There are lots of other cool climate areas in the US that are growing grapes now. Davis Bynum has a long history. He started in 1951 and they ran into Robert Mondavi, bought some grapes, and simply started. 15 years later, he was working as a reporter for the SF Chronicle and he had wine on the table his whole life. He was one of the pioneers of the Russian River Valley and Pinot Noir. Dan remembers some of the other pioneers in the early Napa and Sonoma wine business. As they taste a 2015 Chardonnay, Dan explains that it has a slight minerality that you don’t see in California wine too often, because it is a risky wine to make that way. He likes the acid which Greg says is deliberate, they pick early. The flint and mineral will last, if it is aged. Justin Seidenfeld has been with the Rodney Strong Wine Estates for 8 years, overseeing their Sonoma wines. This project started in 2010, with planting and then design and construction of the new cellar. He now oversees all of Rodney Strong as well as this brand. It is the Cooley Ranch, a 20,000 acre property. They have a 70 year lease. They isolated the best parts of the property, to isolate the best 200 acres for vines. They planted a gamut of Bordeaux varietals with some Syrah and Viognier. They also taste a Russian River Valley Pinot Noir that Steve says is “silky.” It’s a 2016, Dan says the flavors are in the aftertaste, intense fruit, but it explodes on the finish. The pH is 3.55 which is low, and Dan says that means it will be stable once opened, and will still be good the next day. He thinks it may last 10 years in the cellar. Justin tells the first Rowen vintage was 2014 and this 2015 is their first national release. It has almost all sold out. It’s 60% Cab, 20% Malbec and 20% co-fermentation Syrah-Viognier. Rowen means an unexpected windfall, since they didn’t know how good the vineyard would be. Justin says, “when you grow grapes at high elevation, it’s warmer at night and cooler during the day, which maintains natural acidity with good structure, good color, silky tannins without low acidity making it flabby.” Dan says it’s 14.5% alcohol but you don’t taste the alcohol so much. The next tasting is a 2015 Pinot Noir from the Pommard clone, grown in Jane’s Vineyard. Cola, orange peel, falling leaves, are all in the flavors. They use native yeast fermentations. Then they taste a wine called 2040 from Rowen. (It’s the bottle on the left in the illustration above.) The peak elevation on their property is 2040 feet above sea level. They planted the crest of that hill with Clone 30 Cabernet (the Disney clone). Silverado vineyards in Napa is the source. The clones get names from the sources, such as the Coppola clone. Dan tells that it was Walt Disney’s widow who founded the property. That clone is also called Clone 30.